Previously, I discussed what fonts are generally acceptable to use for your resume. But what about font size? 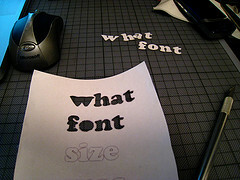 What are the font sizes you should use for your resume? Pretty simple: keep it between 10pt. and 12pt. font. 13pt. maybe. But nothing bigger than that. If you go smaller than 10pt. it’s probably too small to read comfortably. If you go bigger than 13pt., you’re looking cartoonish, and worse, it might look like you’re trying to make up for not having much of a career history to put on a resume. In other words, if you have crazy big font sizes, that might say to the reader: this guy has so little experience he can’t even fill out one page. Really, your sweet spot is the 10pt. to 12pt range. Don’t be afraid to try 11pt. if it works! You really just want to adjust the font size to fit the pages as fully as possible. If 10pt. gives you 3/4th of a page of text but 12pt. fills the page, then go with 12pt. DON’T USE ONE FONT SIZE FOR YOUR ENTIRE RESUME. We’re not in the age of typewriters, people. You should use different font sizes for section titles like “Education” “Career History” “Profile” and things like that. And your name at least should be big and bolded at the top. That’s not written in stone. It’s just a thumb guide for a strategy you could take. But play around and try different sizes to see what looks good to you. And as always, remember that professional resume help is out there.